Profits may be up at Honeywell as of late, but that doesn't mean the company is on solid footing. Honeywell (NYSE: HON) has been on a roll as of late as net income more than doubled over the past five years. On the way, the company has become a leader in operational excellence and become a more focused industrial manufacturer. So, as 2016 begins, what risks does the company face? Here are three investors need to keep an eye on. After seeing revenue fall 4% to $38.6 billion in 2015, Honeywell expects to grow revenue 3%-6% in 2016. That's being driven in large part by $5.5 billion worth of acquisitions, but any disappointment on the top line won't be received well by investors. There's already a lot of concern that Honeywell is slowly fading and doesn't have any real opportunities for organic growth. Oil & gas demand will be down again this year, and innovative new players are disrupting legacy businesses like thermostats and safety & security. Margins have been the focus the last few years, but the easy margin expansion is done, and now it's time for Honeywell to return to growth. If it can't, the stock could head lower. Expanding margins has been Honeywell's strategy for the past five years, and it's helped drive the stock price higher. But the easy cost-cutting measures have probably been done, and now margin expansion will be more difficult. After increasing segment margins from 16.6% in 2014 to 18.8% in 2015, management is hoping margins will rise to 18.9%-19.3% in 2016. If there's nothing left to be squeezed from a cost perspective, the stock could lose its momentum gained in recent years. And then the focus returns to revenue growth, and we know that won't be very impressive at this point. When oil prices fall a little bit, there can be both good and bad impacts on a company like Honeywell, because some raw material costs will go down, some demand will dry up, but all in all, the good evens out the bad. Still, the events we've seen in the energy sector mean there's a wide-ranging impact, even at Honeywell. Not only will the company's oil & gas customers be negatively affected in 2016, but we're already starting to see broader negatives in other parts of the economy. Metals prices are down, mining has been crushed, and other adjacent industries are negatively affected. 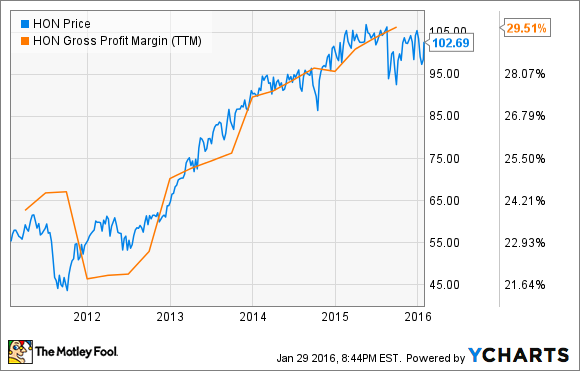 As an industrial supplier of a variety of controls and other components that could have a negative drag on Honeywell in 2016, it's something to keep an eye on since it could hurt both sales growth and margins. Shares of Honeywell have surged 78% in the past five years as net income has surged 113%. But over that same timeframe revenue is up just 15% and there's no sign of the top line improving anytime soon. With the stock trading at 18 times earnings, slightly above the Dow Industrials average of 17 right now, I think the risks I pointed out above are too big to overlook. There's only so much margin a company can squeeze out in operational excellence and without organic revenue growth I think the long-term investment outlook for Honeywell is bleak.